Dascha Polanco plays the jailbird sweetheart, Dayanara Diaz, in Netflix's new original series "Orange is the New Black." Twitter: @Dashpolanco , Instagram: SheisDash. It's not easy being in prison. But it could be fun if you're an actress in Netflix's new original series, Orange is the New Black! Dascha Polanco recently stepped into the entertainment world in NYC and has become one of the favorites in OITNB. Let's find out what makes her tick! What was your audition like for Netflix's Orange is the New Black? I had overlooked time and had to make it there from Brooklyn by 12:45pm on a Saturday. I left at 12:06 and made it by 12:32! (Fast and furious). I was wearing scrubs and my hair was wild and curly. It was via video and all I was told was that it was a jail themed series by Jenji Kohan. I had no idea what the storyline entailed. I left there thinking they always say "Great, good job" but did she mean it? Hmm... I placed it in the back burner of my mind and resumed my life. I got a callback the following Saturday. I was attending nursing school and had to shift things around to make the appointment. This time, I was told to play a naive girl. I nailed it! My feedback that time was "That was great! I have to get you in here!" What's it like working on a series for Netflix as opposed to working on Unforgettable which is network TV? On Unforgettable I was a guest, so it was just in and out! They were all very courteous, though. It was all very quick. There was craft services [food] outside of set and I was in the honeywagon. I filmed it on October 31 and by mid-November it was on TV. Netflix was my home; I feel like I can take my shoes off and open the fridge. There was craft services, lunch and Friday treats. I had assorted dressing rooms. With such a large cast we would rotate, from half trailers to honeywagons to shared space. The wait to see the end product has been filled with killer anxiety and nail biting galore. Have you seen any of the episodes in full or do you have to wait for Netflix to air them to see them? I only saw the pilot. I have learned to watch myself and give myself constructive criticism. Although I have to cover my face and peek sometimes! ! It's really difficult to see yourself and it not be you, but you know that it is you. It's complicated! When you went to the premiere party, you were dolled up by Caravan Stylist Studio. What was that experience like? I have a great publicist who took care of all that for me along with Netflix gifting me with an expense budget. I actually am not a challenger but am very daring. I love fashion and am not scared to deviate from the norm. However, my Carmen Marc Valvo dress and shoes Je'taime... I felt so good in it! Valerie Star and Claudine DeSola at Caravan just know what to do to me. Does your contract state you're to be in Season 2 of OITNB? My manager handles all that for me. I am unable to disclose any of that information as of yet. What's so special about Miami? It was good to me. I did a lot of performing arts and school activities. My family was complete at the time. I lived there during the 'growing up years' -- got my license, made a lot of friends. It was my emancipation. Tell us about Gimme Shelter. It was a star struck 24/7. Long hours, very surreal. I mean James Earl Jones was there! It was my first job! I played a bipolar young mid-teen's single mother living in a religious shelter. There were moments that surprised me but it was all a learning experience. 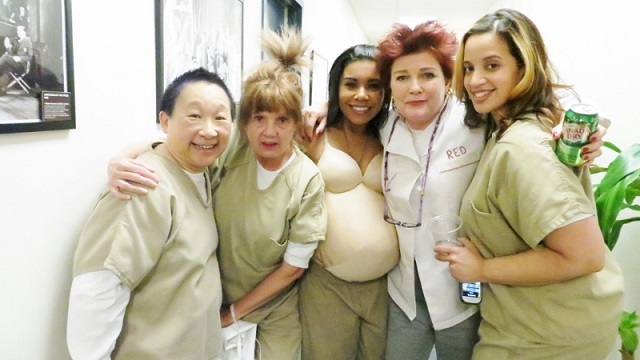 Dascha Polanco with her "Orange is the New Black" castmates. What did you do for a living before acting? I actually had a job while I was acting and was a nursing student which I had to drop due to my 9-5 job at the time. I managed an instrument room at a hospital in the Bronx. Are you married or do you have a significant other? I am engaged to a good-hearted man that supports me and allows me to be me. We met at the Dominican Day parade. What was the best piece of advice you received as a little kid that's stuck with you through adulthood? Do whatever you want to persevere, work for your own things and do not depend on anyone to be your provider. That way, in the future, you will be all right regardless of the circumstances. Not really. I lost my mother and things changed from there. Family can be a tricky one sometimes, but I have an amazing fiance and three great kids. How far did you get in school and what were your favorite subjects? I have a bachelor's degree in psychology. My favorite subjects were organic chemistry, forensic psychology, theatre and film class and drawing. I was interested in being the chemist that works in the fragrance world, smelling all the perfume ingredients. I am obsessed with perfumes and I think I have a great nose for that. What's your every day wardrobe when you're not working? I am a moody girl. I love to dress with accessories. I'm happy in sneakers and happy in heels. I am not currently involved in any charities, but it's something that I will be focusing on this year! My soul enjoys helping and I love to give back.